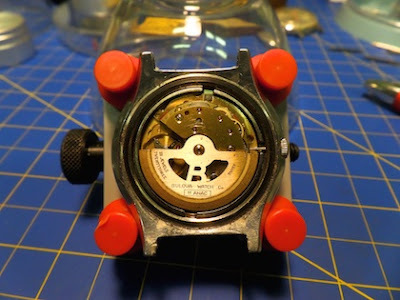 Part of my retro watch obsession is cleaning and refurbishing my project watches. 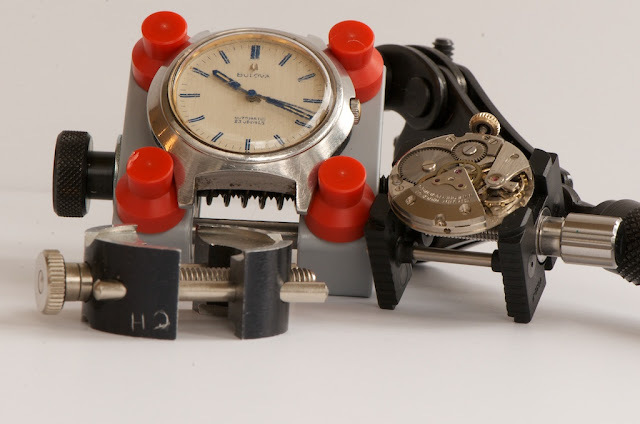 Disassembling a watch takes different tools depending on the watch case type and size. I have a 1970 Bulova project watch that is large and has a screw down back. This is a new vintage for me to work on as my collection is typically pre-1970s. Found it at a local antique store and decided I liked it; out came the wallet. 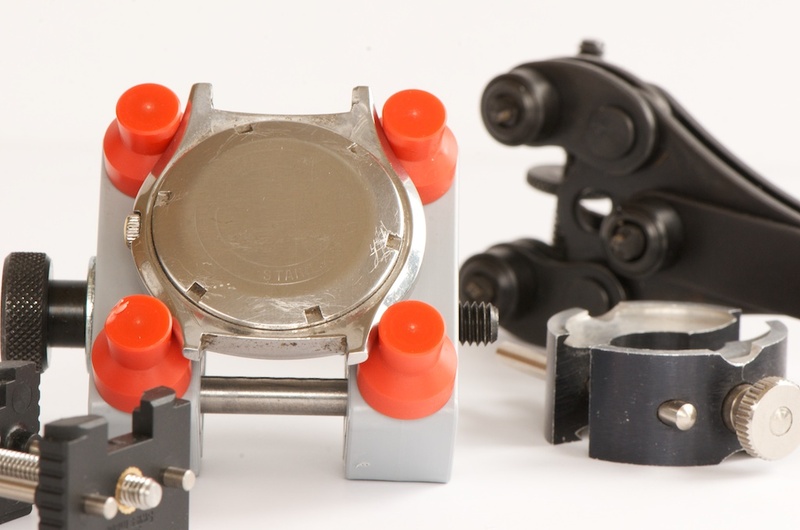 This type of watch requires a special wrench to remove the back along with a larger movement holder/vise in order to cradle the watch and be able to put torque into the wrench in order to unscrew the case back. Until recently all of the watch holder movements I've had (all 2 of them) have been for small movements typical of pre-1950s wristwatches. While not in the same number as watches in the world, there sure seems to be a lot of different watch movement holders. 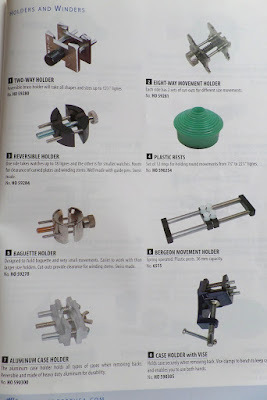 Check out just two pages of a tools catalog of mine. Holders of all shapes and sizes to hold a corresponding number of watch shapes and sizes. Bring out your wallet when you open up this catalog! 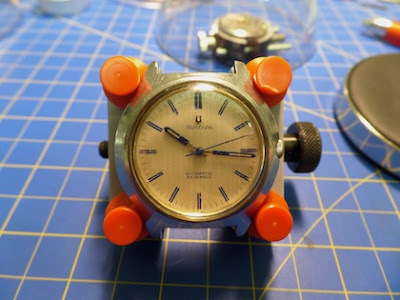 My 1970 Bulova project watch is quite large and when I first tried to disassemble it I was using a small holder and was unable to get enough torque with my case wrench to open the back. I even tried putting the small holder into a bench vice in order to stabilize it so I could add some torque to the wrench. The bench vise didn't work. As a matter of fact, the watch and holder flew out of the bench vise and landed across the room onto the shop floor - no worries, nothing damaged but my pride. 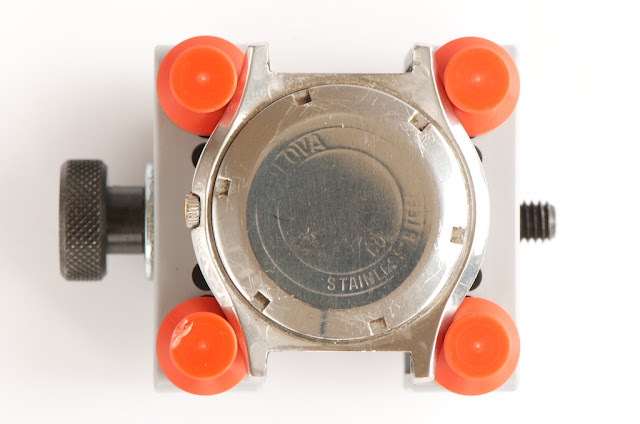 When I went online to see how you get a stubborn case back off, one of the techniques was to epoxy a bolt to the back and use a standard socket wrench. Apparently the epoxy comes off with acetone. 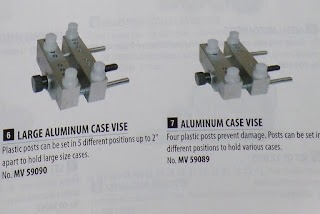 Well, I didn't need to use an epoxied bolt, I simply pulled out my wallet and bought a new extra large vise that you see below with the my Bulova watch in it. Enter the Big Guns. The great thing about the new vise above, it also properly fits into a bench vise to give you extra stability to torque those most stubborn case backs - no more flying watches. That being said, if you look closely above you can see one of the orange pegs got damaged from my wrench slipping - gadzooks, damage to a brand new tool no less! 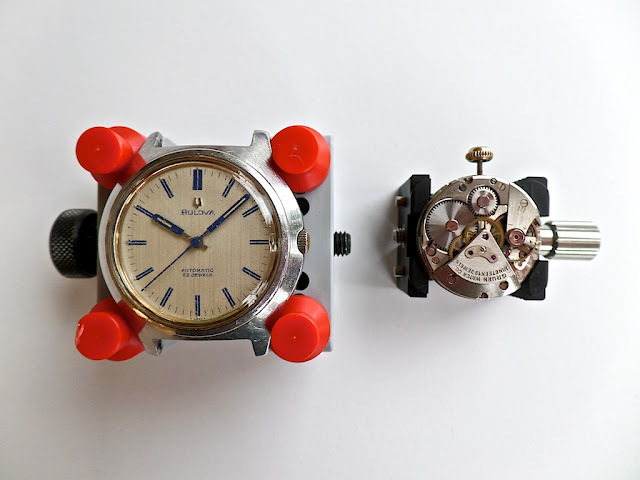 To give you some scale to the different size watch cases and corresponding holders/vises, check out the picture below of the 1970 Bulova sitting side by side with a 1950 watch movement from a Gruen project watch I'm working on as well. The two pictures below show 3 different size and shaped holders along with a case wrench in the background. BTW, not all case backs are threaded and come apart using a wrench, many are snap back that use friction and small dimples to hold the back and the front (called the bezel) together. To open those a simple pocket knife will do (or you can do what I did and opened my wallet and bought an expensive case back opener). I'll let you know how the 1970 Bulova turned out once serviced and cleaned in a future blog. For now, I brought out the big guns with this extra large case vise so I can start the disassembly process - it worked. Retro is my favorite brand in watches. I have three watches of Retro so far of different style.